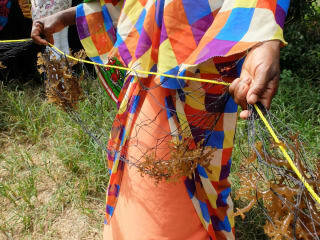 The use of tubular nets in seaweed farming is enabling women farmers in Zanzibar to cultivate profitable varieties. Through training in seaweed processing, the farmers are also producing innovative products for the food and beauty industries. In Zanzibar, ordinary fishing nets are being recycled into airless cylindrical shapes – known as tubular nets – for use in deep-water seaweed farming practices. The nets are stuffed with seaweed seedlings, which grow and multiply along their length when planted 2-6 m under water. The technique, which is more environmentally friendly than traditional farming methods, is helping women seaweed farmers produce high-value varieties for processing. Seaweed is Zanzibar’s third largest industry after tourism and cloves, bringing in about €2 million annually. Fifteen to 20 years ago, women seaweed farmers in Zanzibar planted Eucheumacottonii and E.spinosumseaweed varieties in shallow waters off the coast, but due to climate change, surface water temperatures have increased from 31 to 38°C. This has significantly affected seaweed growth, which decreased from 1,048 t in 2001 to 58.4 t in 2015 – a drop of 94%. Farmers have had to switch from using the traditional floating line method – where nylon ropes covered with seaweed are tied between two wooden pegs – due to massive quantities of seaweed dying off before it had developed. “The traditional peg and rope seaweed farming in shallow waters became less and less profitable,” says Flower Msuya, senior researcher at the Institute of Marine Science at Dar es Salaam University. “I adapted the tubular nets to help women continue farming high-value seaweed in deeper waters,” she says. The new method also reduces disturbance to marine life and reef habitats as farmers no longer walk along the seabed to plant the pegs, but instead use boats to get to deeper water where the nets are placed, Msuya explains. The tubular nets were piloted through a Sea PoWer project in April 2017, when 35 women were trained in their use. The women have also learned to place basket traps in their seaweed farms to attract fish, such as rabbitfish, spadefish, parrotfish and eel for consumption and sale. “I wanted a better method that would empower women farmers in future to keep growing quality seaweed and secure their incomes,” says Msuya. “A model farmer can earn between US$300 and US$600 [€255-510] after a good harvest,” says Dr Betty Nyonje of Sea PoWer. In 2006, Msuya also established the Zanzibar Seaweed Cluster Initiative (ZaSCI), a network of academics, government officials and farmers committed to improving seaweed farming and climate adaptation on the island. A group of 21 women from Kidoti in Zanzibar were the first to be trained by ZaSCl in seaweed powder production for use in soap and body cream products. Today, there are eight groups of women trained to plant and sell seaweed on the island, and thanks to further training in value-addition provided by ZaSCl in 2008-2009, over 300 seaweed farmers now make more than 50 products, including juices, jam and massage oils, either as groups or individuals. Seaweed farmer Mwajuma Mwinyi says that before learning new skills through the cluster programme, she used to sell 1 kg of seaweed for TSh 400 (€0.15), but now she makes up to TSh 30,000 (€11.30) from seaweed soap made from the same quantity of seaweed.